Is this the single best shoulder exercise known to man? Arnold Schwarzenegger sure thought so which is why he proudly attached his name to it. But if this exercise is so good then why the heck do you hardly ever see anyone doing it at the gym and why is it never included in a workout routine? Probably because it is hard to do properly so people who tried it never saw the results they expected. First things first, this exercise is also known as the Scott Press. Larry Scott, the first Mr. Olympia started doing this exercise about a decade before Arnold did. But they both used to effectively to create some pretty impressive shoulders. No matter what you want to call it, the exercise is very effective when done properly to hit all three heads of the deltoids at once and is great as a pre-exhausting exercise o a finishing move. People who read Arnold’s Encyclopedia of Bodybuilding had a few pictures and a brief description to work with for doing the exercise. 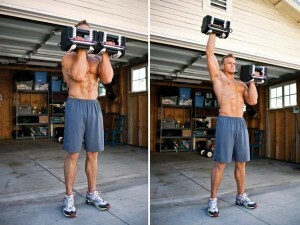 They would start with a pair of dumbbells held together at shoulder level with palms facing you. Then the weight would be pressed overhead, rotating the wrists outward as you complete the press. In the picture Arnold’s arms weren’t locked all the way out but they were close and you couldn’t see how his elbow moved. The proper movement is a combination of a partial shoulder press and a rear/side lateral but from a standing position. The movement looks incredibly odd like someone is trying to do a chicken dance but while holding a pair of dumbbells. Start with a pair of dumbbell held at about head height. Your upper arms should be just below parallel to the floor with elbows pointing out from your body just wider than shoulder width at 10 o’clock and 2 o’clock if the center of your chest is at noon. Your palms should be facing each other. You are only going to press the middle 3/5 ths of the shoulder press. As you press up rotate your wrists so your palms end up facing front while your elbows go back and up. The natural instinct is for the elbows to drive up but you want them to go back first like you do for a rear lateral raise; they should lead the motion. Stop when your elbows get to your ears and then reverse the motion. This shorter range keeps all the tension on the deltoids and does not give them a chance to rest. As you press back and up your head will naturally push forward and down, looking a bit like a chicken. Start with light weight to master the form. You will know when you are doing them correctly because after one good set you should feel a nice burn starting on all three heads of the deltoids. As the elbows go back the rear and side deltoids are engaged then going up the side and front deltoids take the brunt of the work. But the movement is small and compact with the dumbbells only travelling 8 to 12 inches total. But when you do it correctly it is so much more effective than pressing a dumbbell twice that distance. For more training techniques, follow Nutribomb at our Fitness Blog. You can also keep up with our latest posts at our Google Plus Page.